Despite being fun, a lot of people hate camping. There is no comfortable place where you can sleep. Bugs and mosquitoes can be annoying. No decent selection of foods when you go hungry. Cooking can be a challenge. And, chances are, you won’t have a clean and fully-equipped toilet to use. 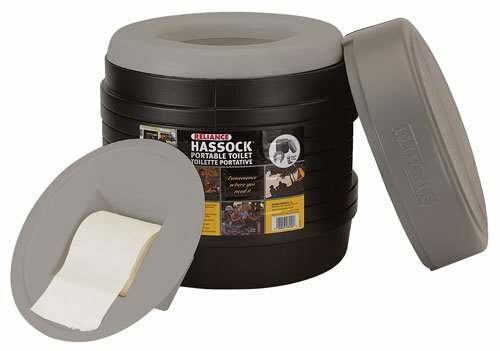 Fortunately, you can always bring the best portable toilet, including those that are briefly mentioned in the rest of this post. Keep an eye on these products to enjoy the best value for the money. From the construction to the design, these toilets are guaranteed to make you prepared for the call of nature in the wild! Do not make things any difficult for you. Below, we will have a quick rundown of some of the products to include on your list, as well as the things that make them better than all others. No restroom, no problem! Even if you are in a campsite, you can bring this toilet with you. It is sleek and lightweight, which also makes it perfect for an RV. It comes with an innovative and comfortable design, which makes it one of our personal favorites from the products on the market. Looking at its features, one thing that is exceptional is the capacity of the toilet, which is great considering its size. The flush tank can hold up to 2.5 gallons of water. On the other hand, the waste tank has a capacity of 5.3 gallons. As for the weight capacity of the toilet, it can accommodate users who are up to 330 pounds. The toilet is designed with the needs of the users in mind. The flush button is strategically positioned on the top. There is a latch on the side that keeps the waste tank secure, although there are some complaints with how the latch could have been tighter. There are also integrated handles, which are great for the portability of the unit. It weighs only 11.5 pounds, so there is no need to worry about bringing it with you in the campsite. 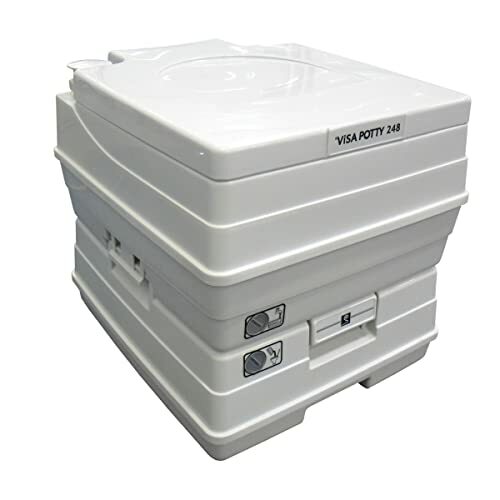 Your convenience and comfort will be assured with this portable toilet, which weighs only 11.5 pounds. It is designed with your comfort and hygiene in mind! One of the first things that you will notice in this product is the curved body, which makes it a good-looking toilet. Despite being curved, it is still space-efficient. More so, based on the technical specs from the manufacturer, the fresh water capacity of this toilet is 4 gallons. On the other hand, the waste capacity is 5.5 gallons. This is quite expensive than most of the competing models that you can find on the market. The price, however, can be justified by the fancy and functional features. For instance, the flush is battery operated, which makes it automatic. Also, it comes with an integrated tissue holder. In terms of functionality, you will also love this portable toilet. There is an ergonomic carrying handle that makes it effortless to bring the toilet in the campsite. It also comes with an easy pour-on sprout, which is beneficial when it comes to emptying the waste tank. The manufacturer notes that this is self-contained, which means that water and waste won’t leak out of the tank. However, in terms of odor, it might easily escape from the tank based on the experiences of some users. This product looks like a domestic toilet because of its curved design. It has sealed tanks, a battery-operated flush, and an integrated tissue holder. If you are looking for an affordable portable toilet that does not compromise quality and performance, this is one that should be on the top of your list. Despite being cheap, you can expect excellent features in this product. It is not as fancy as the other toilets that are mentioned in this post, but it will already suffice for most people. One of the things that we liked the most in this product is the contoured seat, which will ensure your highest level of comfort when it is used. There are some, however, who noted that the toilet can be quite unstable. When it comes to its construction, polyethylene is the main material that is used. It is long-lasting while being lightweight. In fact, the toilet weighs only less than five pounds. The toilet also comes with an inner cover to provide protection from spills and splashes. On top of this cover, there is an integrated tissue holder. One more thing that sets this apart from many of its competitors is the five-year warranty that is offered by the manufacturer, which should be enough to provide you with peace of mind. This is a lightweight portable toilet made of polyethylene. This is the perfect option for those who are on a budget. 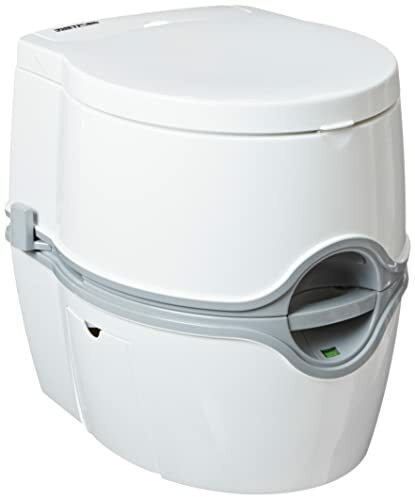 If money is not an issue, this is a portable toilet that you might want to consider choosing. This is a bit bulkier compared to most of its competitors. This also means that the capacity is higher, eliminating the need to have the waste tank frequently emptied. Speaking of the latter, the holding capacity of the waste tank is 4.8 gallons while the water tank capacity is 3.7 gallons. It has a special feature that makes it easy to read the water and waste tank levels. 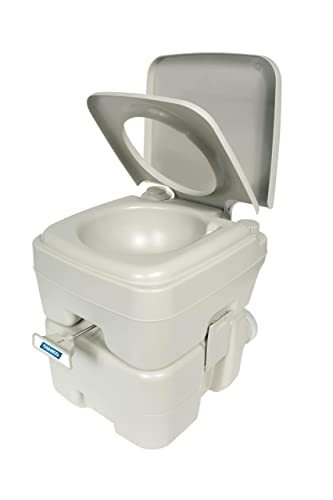 Among others, this portable toilet is also exceptional because of the design of the piston pump. With the latter, there is a two-directional rinse that reaches both sides of the bowl, making sure that it is clean after every flush. 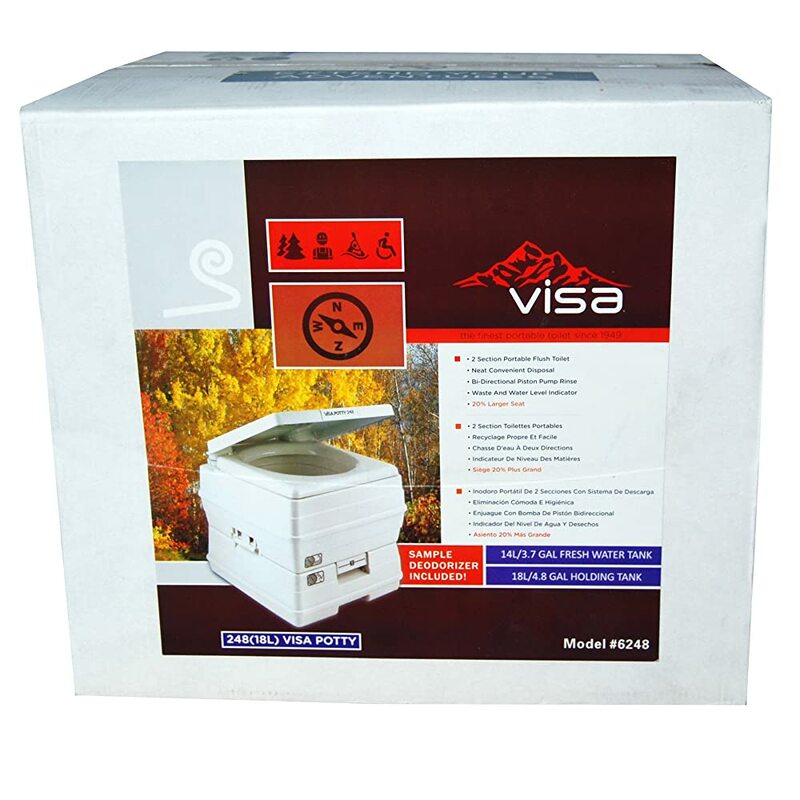 The vented tank is another feature that makes this an excellent choice for the best portable toilet. There is a detachable sprout that you can find in the compartment, which will make it easy to empty the waste once the tank is full. Lastly, in terms of construction, the main material used in this toilet is thermoplastic, which is known for its durability. This material is also freeze-resistant and is easy to clean. This is an expensive option for a portable toilet, but you can have an assurance that quality is never compromised, especially because it is made of freeze-proof and long-lasting thermoplastic. One of the things that we liked the most in this toilet is extreme portability. This is basically because of its foldable design, which significantly minimizes its size when in transit and not being used. 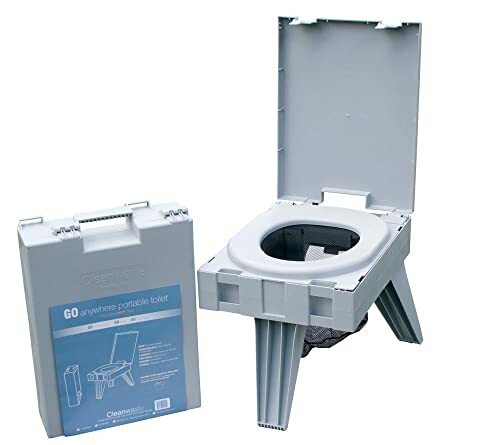 The sleek body of this portable toilet can be attributed to the absence of a built-in waste and water tank, unlike those products that have been mentioned above. Instead, it has a mesh kit that holds a bag where the waste will be directed. The mesh kit is an excellent add-on feature as this prevents the bag from slipping. The waste bag that is included is also worth mentioning. It is not just made of any plastic. Instead, it is made of a biodegradable material. It is made using an eco-friendly material that will turn the waste into an odorless material. The strength of the toilet is often praised by its users. It is made of a premium material that is capable of supporting a maximum weight of 500 pounds. However, because the legs are foldable, there have been some complaints with regards to how it can be unstable or easily prone to snapping. When this portable toilet is folded, it looks like an ordinary briefcase. It does not have a built-in tank for waste and water, which is why the size is significantly reduced. Size: As much as possible, choose a compact portable toilet that is also lightweight, which means that it will be easy for you to bring it in the campsite. Capacity: This refers to the amount of water and waste that it can hold at a given time. Those with larger capacity will obviously be bigger. Also, this refers to the maximum weight of the user that can be supported by the portable toilet. Comfort: You have to look at the quality of the seat to be sure that you will be comfortable when you are seated on the throne. The best ones have a contoured seat. To be comfortable, it should not also be too low on the ground. Stability: It can be annoying to be sitting in a toilet that is wobbly while you respond to the call of nature. With this, find one that remains stable even when you are seated. 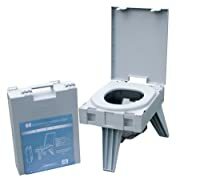 Durability: It is also important that you pay attention to the materials that are used in the portable toilet, which will be indicative of its longevity. Ease of Use: This refers to how easy it will be to dispose of the waste from the tank once it is already full. Waste System: There are some models with a built-in tank that collects the waste. On the other hand, there are also some models with a biodegradable waste bag. One of the most common problems with camping toilets is their stability. There are some with legs that can feel wobbly, especially for people who are quite heavy. The odor is another common problem in a portable toilet. There are instances when the waste tank is not sealed enough, allowing the odor to escape. This can cause an unwanted smell in the campsite. It will be best to position it far away from the sleeping area or the tent so that the odor will not be disturbing. After the camping trip, make sure to clean the portable toilet before its storage. Wash it with warm water and mild soap. Or, follow the instructions indicated in the manual provided by the manufacturer. Do not wait for a long time before disposing of the contents of the waste tank. As soon as you have the chance, make sure to have it emptied. You can also create your own spray of soap and water. After every use, spray this on the toilet, which is one way to mask the foul odor. Take note that there are some toilets made of materials that can easily react to chemicals. As much as possible, avoid using chemical-laden cleaners so that the material will not be damaged. Use a deodorizer. Most of the toilets with a built-in flush system will come with such a feature. This gives the toilet a fresher smell after every flush. However, as much as possible, avoid flushing often as this will be a waste of water. When nature calls and you are in the campsite, there is no need to worry. With the best portable toilets that have been mentioned above, you do not have to squat on the ground! They are not only comfortable but also hygienic. Invest in one of these toilets and you will surely enjoy your camping trips more.